Round sling is made by the high quality material of synthetic fibre which is very compact design.we can manufacture different styles for round slings.with range from 0.5t-1200t. 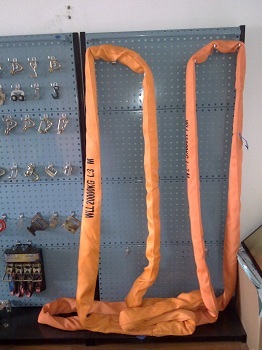 The advantage of round sling is:light weight.hight tensile.patallel core & twist core. RK ype lifting belts adpoted high-performance ployamide to manufacture,which are resistant to high temperature,from-40°to 180°,with 1/2 self weight of narmal one.